Movies about modern warfare, which I am defining as post-9/11 era, are tough to get behind as entertainment. These are generally extremely realistic, violent, and bloody films about a conflict that is still ongoing on the other side of the world. It is difficult to sit back with our buckets of popcorn and giant sized sodas and enjoy something when we know that there are people suffering the violence we see on screen even while we watch. 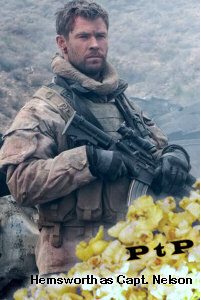 We can certainly absorb a movie like 12 Strong and appreciate the heroics of the brave men being portrayed on screen and we can also appreciate the talent involved in making the film, but it is a difficult movie to enjoy or be entertained by without an accompanying sense of guilt. 12 Strong tells the previously classified story of the “horse soldiers,” the first Special Forces team deployed to Afghanistan following the 2001 attack on the World Trade Center. Chris Hemsworth plays Mitch Nelson, a Captain leading his first field mission. Captain Nelson takes eleven of his best men into Afghanistan where they will aid a northern army leader named General Dostum in clearing out the Taliban who are currently in control of the area. They are outmanned and outgunned, riding into battle on horseback despite the fact that only one of the twelve men has any real riding experience. The movie chronicles their challenging efforts to defeat the overwhelming opposition, while also trusting the Afghan soldiers fighting alongside—knowing that any one of them could change loyalties at any time and turn them over to the enemy. The ups and downs of their mission are told in action set pieces that certainly demonstrate the horrors of war, while also at times feeling like something out of a modern video game shooter. The story that 12 Strong tells is an important one to know. The men at its center were our first line of offense in our 9/11 response and no matter how one might feel about the politics of the whole situation, it is easy to admire these brave men for the nearly impossible task they undertook and the pure will it took for them to succeed. But the movie does not really tell us much about the men themselves. The film only gives us any real backstory for three of the men and these were the men portrayed by the most recognizable actors in the movie—Hemsworth, Michael Shannon, and Michael Pena—whom the audience already has a history with and probably required less of a backstory from. The rest of the twelve men are almost indistinguishable, with only Trevante Rhodes’ Ben Milo given anything extra to do in the form of an Afghan boy he comes to bond with, but even this feels more like a war movie cliché than any kind of actual character development. Instead of spending more of its 130 minute runtime on the development of its heroic characters, the movie wastes a good five minutes on a scene showing a Taliban leader abuse and murder a woman for trying to educate herself. If there is one thing we as an audience brought into this movie on our own it is that the Taliban is evil and are the villains of the story. We don’t need the movie to go out of its way to remind us that they are evil, just as Indiana Jones needed to say little more than “Nazis, I hate these guys” to get us to hate them also. 12 Strong is well acted, well photographed, and features mostly solid visual and sound effects, but does not quite work as an entertainment and does little to separate itself from other similar modern war films. The film is based on the non-fiction book by Doug Stanton called Horse Soldiers and is the type of story that might work better as a read, rather than seeing it play out like an action movie on screen. 12 Strong is now playing at the AMC Kent Station 14, AMC Southcenter 16, Century Federal Way, and Renton Landing 14.